A girl for all seasons: "There's no show like a Joe show"
My friend Lorna has been in the wars! She broke her wrist while at Oxygen festival this year. When we heard, we shook our heads in disbelief. Serves her right for still going to music festivals at our age!!!! Avoid broken bones by never growing up! 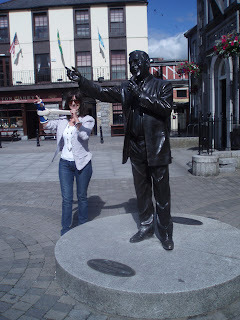 She was down home for the day, so we went mooching around the shops in our local town of Mullingar. As we walked across the market square in a rare bout of sunshine, the seats outside Canton Casey's pub beckoned us. "We'll have one wee drink, we are on holiday." Okay, so only one of us is on holiday, the other is on sick leave. Even more cause for a cool beer. 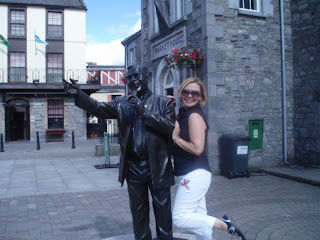 We sat, sipping our drink and watching the tourists getting their photo taken with the statue of Joe Dolan, which takes pride of place in the market square. For those of you who are from another country/planet, Joe Dolan is the most famous son of Mullingar. He was an international singer, whose career spanned several decades. His funeral was one of the largest ever seen in the area. Bus loads of people came from all over the country. In fact it is said that so many people visited his grave and took a handful of clay as a momento, that he was almost dug up again. A security guard had to be put guarding his grave! As we sat looking at them we realised that we had never had our photo taken with our Joe. As I always have my trusty camera with me, we soon rectified that situation! "What are you two ejjits doing taking your photos with Joe? Who do ye think ye are....feckin' tourists??? ?